Please note that any electronic equipment that has a built-in power supply or DC converter can still be dangerous even with no obvious power supplied! (If you want to know why, look up "capacitor".) I do not guarantee your safety or the safety of your equipment. Never touch exposed electronics. Ground yourself before opening any gear. Work in a clean environment where you will not be disturbed by children, dogs, cats, ferrets, rodents or marsupials. Prepare by gathering all needed tools. In this case you need a 2.4mm screwdriver. I always lay out some sticky tape or blue tack in a small container, so that any screws I remove can be secured. There is nothing more annoying than losing a small screw. Turn your laptop over and make sure it is disconnected from the mains. The first thing to do is remove the battery. Locate the horizontal sliding clasp and fingernail insert (red) that allows the battery compartment lid (white) to pull right off. With the battery lid removed, pull down on both tabs to ease out the battery. You've probably done this before. 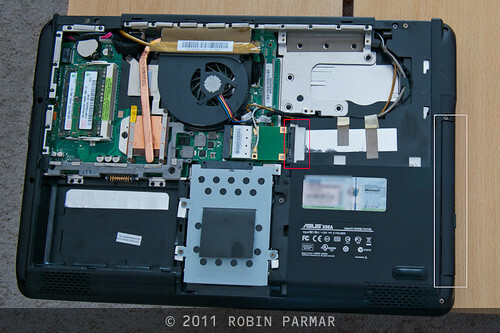 Now you need to unscrew the first of two screws (red) in order to remove the hard drive door (white). This screw is quite small in length. 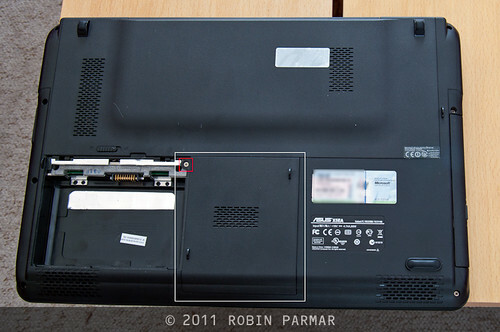 The hard drive door is removed; we can now see the hard drive caddy. 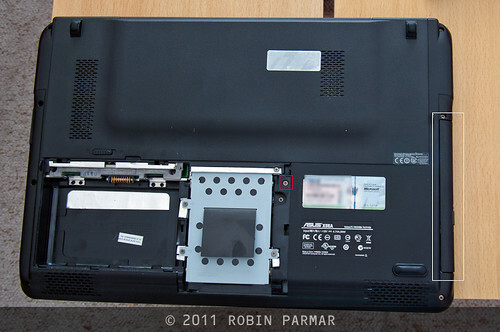 More to the point, we can see the screw (red) that secures the DVD drive (white) in place. Undo this. Note that is is significantly longer than the first screw. Don't mix them up! Here I have removed the top panel for illustration purposes. You do not need to do this -- in fact I'd recommend against. Here we can see the SATA connector (red) that the DVD (white) attaches to. Pull on the DVD fascia and it will slide right out. 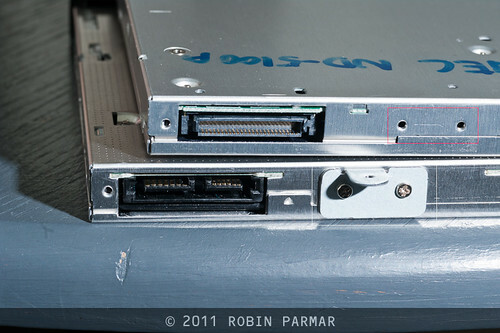 Here we can see the exposed SATA connector and the screw hole now missing the little tab of metal... because it's connected to the DVD unit! Here I compare an older DVD drive (top) to the SATA connector drive we just removed (bottom). 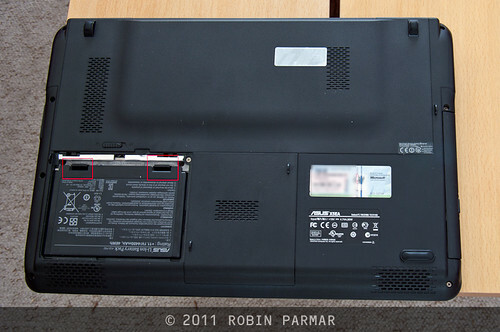 Note that the little securing tab is on a mount secured by two screws. The top drive does not have one, but you can clearly see the screw holes (red). It's easy to remove the tab from the old drive and put it on the new one, should it be missing this important accessory. One thing we cannot do is put the original fascia on a new DVD drive. This is because it is not secured in place with screws but rather with glue. I could find no way of undoing this, but if you are more successful, let me know in the comments. Go ahead and fit your replacement DVD drive and slide it into place. Secure the screw through the little eyelet, replace the HD cover, insert the battery and replace the battery cover. When you boot up your computer, it should detect the new hardware. If it doesn't you need to go to the Device Manager and prompt it, then be sure the correct driver is installed. This is usually automatic. If this article helped you save time or worry, consider buying me a coffee using the Paypal donation button in the sidebar. Thanks! Thanks for the post, had to replace my drive for the recruiting dvds i make. Thank you for this info - it helped me remove my malfunctioning drive (I had tried simply disabling it in Device Manager, but Windows kept re-enabling it even though that caused a bunch of errors to be continually logged). I have a different model Asus laptop, and it has things positioned differently than yours. 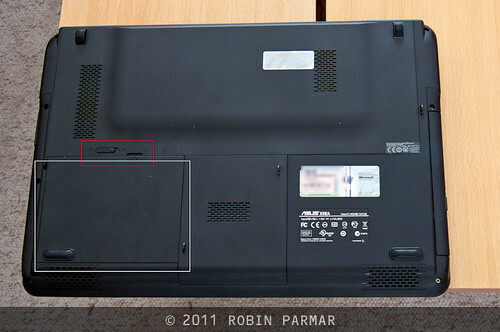 One of the screws holding the DVD drive in is on the outside of the case. The other screw is under the other main panel, similar to yours - the last time I tried getting the drive out, I never thought to check under the other panel. Now I know! Both screw positions were marked with little round DVD icons, which I didn't notice until after having removed several other screws unnecessarily.